In addition to the standard basic pay, benefits and allowances received by all servicemembers, active-duty military, veterans, and even their families are eligible for hundreds of discounts and additional benefits offered by organizations and companies. These discounts are a significant perk available to servicemembers, so we've compiled a list of some of the most valuable discounts and how to get them. Many storefronts offer in-person military discounts, which will require you to show your military identification card (CAC), or a certified veteran identification like the one provided by Veteran's Advantage. Veteran's Advantage is an organization that runs the one of the largest military and veteran's discount programs. The list below covers a small selection of the many companies that offer military discounts through Veteran's Advantage. Click on any company to learn how to get your discount. JetBlue JetBlue proudly supports our U.S. active duty, retired military, veterans, National Guard, reservists, and their families enrolled in Veterans Advantage with a 5% discount on everyday JetBlue travel to 85+ destinations in 24 states and 12 countries in the Caribbean and Latin America. United Airlines Up to 5% discount on tickets for United and United Express-operated flights purchased on united.com. Flights must originate and be ticketed in the U.S. or Canada to be eligible and are valid for travel to all 50 states, Canada, Mexico, Central America and the Caribbean. Verizon As part of its commitment to support the men and women who serve our country, Verizon offers a 15% discount off most advertised Verizon standard monthly plans and features to all military personnel and veterans (excludes data only plans, plans not commercially available or where otherwise indicated). Select accessories are also eligible for a 25% discount. Greyhound Bus Greyhound honors U.S. active duty military, veterans, National Guard, reservists and their families with GREYHOUND BUS TRAVEL DISCOUNTS of 20% off walk-up fares. Wendy's Wendy's is honoring Veterans Advantage members - U.S. military veterans, active duty military, National Guard and reservists, and their families - with special discounts throughout the year on popular Wendy's food and drinks. Office Depot Office Depot honors U.S. active duty or retired military, veterans, National Guard or reservists, and their families for their service with exclusive Veterans Advantage deals for its members who have served our country. Veterans Advantage Members can save 20% every day* at Office Depot and OfficeMax stores, or on OfficeDepot.com with an exclusive discount. 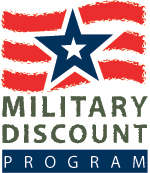 Other companies with existing military discounts include rental car companies Avis, Thrifty, Dollar Rent-A-Car, Hertz, and Budget; hotel chains including Comfort Inn, Wyndham, Red Roof Inn, and Ramada; car companies including Ford and Lincoln; and retailers including Sears, Apple, Foot Locker, Dell, Target Stores, and more.